A superb pair of Victorian glass chemists advertising carboys. 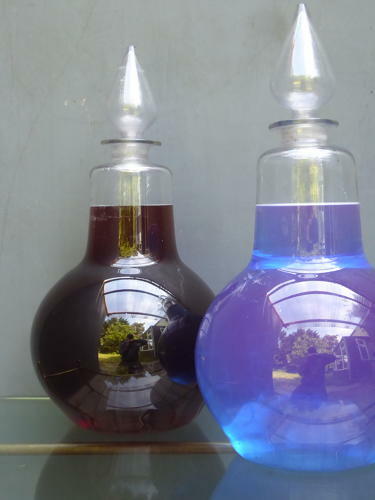 A stunning matching pair of antique carboys which would have been filled with colourful liquid & graced a chemist window as part of an eye catching advertising display. Hand blown & of wonderful form, both retain their original blown glass stoppers & are etched with detailed lozenge marks to the necks which are likely that of the maker. Very unusual to find a pair which have remained together all these years! Price is or the pair. Wear commensurate with age, unrestored, very good overall. The carboys have not been cleaned inside to any extent & the stoppers are also hand blown with 'unfinished' tips. Collection preferred though a UK courier service is available at £30 tracked & signed for 24 hour delivery. The carboys will be sent seperately.